November 8, 2018 – Comprising over 300,000 banknotes from all over the world, one of the world’s finest collection of paper bills is based in Munich. The HVB Foundation Banknote Collection is devoted to the collection, preservation and study of banknotes from every country in the world. The Foundation’s objective and aspiration is to document samples of paper money from its beginnings to the present day and make the bills publicly accessible. The substance of the current banknote collection stems from the private holdings amassed by Albert Pick. In 1930, at the age of eight, Albert Pick began collecting emergency banknotes. This passion soon spread to include all paper money issues, ultimately swelling his private collection to over 180,000 notes in the 1960s. In 1964, Bayerische Hypotheken- und Wechsel-Bank in Munich acquired the collection, retaining Albert Pick as curator. 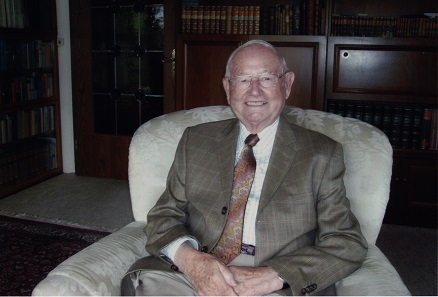 Albert Pick (1922 – 2015). As curator of the collection, Albert Pick demonstrated enormous zeal. The bank earmarked an annual budget that allowed him to expand the collection. Moreover, he branched out into writing books and compiling catalogues about his field of interest. First published in 1975, his best known work, the Standard Catalog of World Paper Money has been reproduced in numerous editions ever since. This catalogue assigned a ‘Pick number’ to every note ever released into circulation, in other words, the banknotes of each country were numbered consecutively in chronological order of their issue. The ‘country/P no.’ combination gives every banknote issued worldwide a valid identifier. In 2003, HypoVereinsbank set up a foundation known as the HVB Foundation Banknote Collection. The purpose of the foundation is to promote this significant collection of paper currency, maintaining it as a cultural asset, conducting scientific analysis and making it publicly accessible. Presenting the collection in the public space is a central aspect of the Foundation’s activities. The history of paper money and its importance as a cultural force are illustrated in exhibitions, publications and lectures. A great deal more than merely a means of payment, banknotes are an integral part of a country’s political, economic and financial history. Moreover, they reflect the national and cultural identity of a country and its regions. 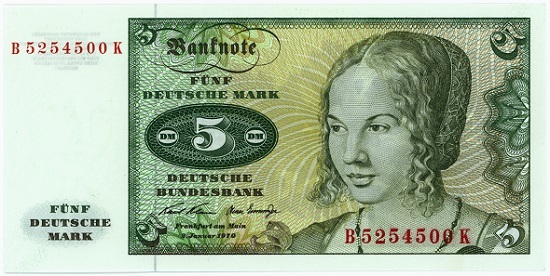 Deutsche Bundesbank, 5 mark note, 1970 with the “Portrait of a Young Venetian Woman” by Albrecht Dürer. For example, the Deutsche Bundesbank’s first banknote series features famous paintings by German masters. The 5 DM note shows Albrecht Dürer’s “Portrait of a Young Venetian Woman”. The second banknote series highlighted prominent personages from art and science, who represent Germany’s cultural heritage. The Foundation also serves to maintain and expand the collection, routinely acquiring new issues and completing the existing banknote series. Further tasks performed by the Foundation include conservation measures, such as storing the banknotes in acid-free, durable albums; as the collection comprises some 300,000 bills, this alone presents a major challenge. The HVB Foundation Banknote Collection documents the development of paper money from its beginnings to the present day. It ranges from Chinese currency dating back to the Ming dynasty in the 14th century to banknotes issued all over the world today. The holdings fall into three categories. The first section contains “World paper money”, referring to the notes put into general circulation by states, governments and authorised central banks. 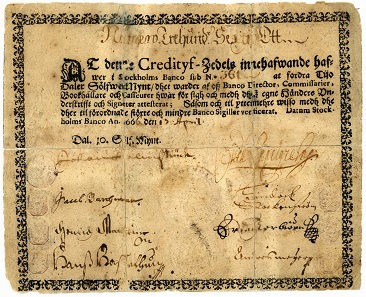 In Europe, this began with the first banknotes issued in Sweden and England in the 17th century. The Sveriges Riksbank and the Bank of England still operate to this day, making them some of the world’s oldest central banks. Sweden, 10 Daler Silvermynt, 1666. The second group is emergency money, or substitute currency, that is floated in times of economic crisis. In Europe, this relates in particular to World Wars I and II, along with the interwar and post-war era. The holdings of German, Austrian, Dutch and Russian emergency money are particularly extensive. The third category comprises special collections, such as stamp money, regional currency or hell money, a type of Chinese novelty money designed to accompany the deceased into the afterlife. Furthermore, it also includes banknotes made of materials other than paper, like leather, wood or cloth. The HVB Foundation Banknote Collection has been represented on bavarikon since 2017. Selected holdings are showcased, focusing on “Paper Bills in Bavaria” and “Rare banknotes from around the world”. bavarikon is the internet portal of the Free State of Bavaria for the presentation of art, culture and regional history, including art treasures and cultural assets from Bavarian cultural and scientific institutions. bavarikon is an initiative of the Free State of Bavaria in cooperation with the Bavarian State Ministry of Science and the Arts, and the Bavarian State Ministry of Finance, for Rural Development and Homeland. The Bavarian State Library is responsible for the ongoing technical, editorial and organisational operation of bavarikon. 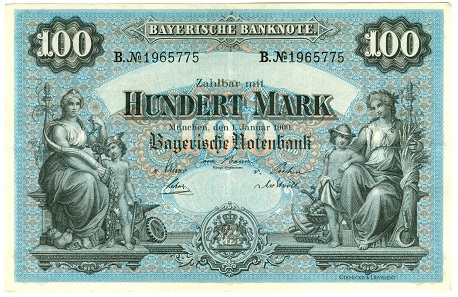 Bayerische Notenbank (Bavarian Central Bank), 100 mark note, 1900. To realise this project, the HVB Foundation Banknote Collection used the numismatic database, Kenom, an online system that enables numismatic collections and museums to index, record and digitalise their holdings. All interested parties are given access to these data in a virtual numismatic collection. The presentation of the HVB Foundation Banknote Collection is available on bavarikon. Click here for the virtual numismatic collection, Kenom (only available in German). Further information on the foundation, the collection and current projects is available on the HVB Foundation. You can read an article on the virtual exhibition by HVB Foundation dedicated to “Emergency Money in Bavaria 1914-1923”.